An analog multimeter is the most commonly used instrument by technicians and engineers in the laboratory as well as other repair works. As it is clear from the name of this instrument, it can make many (multi) measurements with reasonable accuracy such as AC and DC voltages, currents, and resistances. In this article, I am discussing analog multimeter working principle. Since it is a milliammeter, voltmeter and ohmmeter combined together, so it is also called AVO meter. It has various ranges of voltage, resistance and current. An analog multimeter is basically a permanent magnet moving coil galvanometer. There is an iron cored coil pivoted on two jeweled bearings. The coil is wound on an aluminum former or bobbin which is free to rotate in the field of a permanent magnet. An aluminum pointer is attached to the coil and bobbin assembly and moves on a graduated scale. There are two spiral springs attached to the coil assembly at the top and bottom which provide a path for the flow of current and controlling torque. Generally, a galvanometer has a current sensitivity of the order of 0.1 mA and a small internal resistance of about 500 ohms. As such it cannot measure high voltages. To measure high voltages with it, its range is extended by connecting a high resistance in series with the galvanometer as shown in the figure. This series resistance is also called multiplier. The voltage range can be increased by increasing the number or value of multipliers. Either a selector switch is provided to select different ranges or a number of sockets indicating the voltage range are provided in a multimeter. While making, measurement one lead is inserted in the common socket and the other lead in the required voltage range socket. The multimeter can also measure AC. For this purpose, a full wave rectifier is incorporated in the multimeter. The rectifier converts AC into DC for application to the galvanometer. The desired AC voltage range is selected by the selector switch or sockets. When AC voltage is to be measured, the switch should be thrown to AC or test lead should be inserted in AC socket. While using an analog multimeter as a voltmeter it must be ensured that it is connected in parallel with the portion of the circuit across which the voltage is being measured. The range of multimeter should also be suitably selected. The same galvanometer can be used for measuring current when it is converted into an ammeter by connecting a small resistance Rsh in parallel with the meter as shown in the figure. The range of ammeter can be extended to any value within limits by reducing the value of shunt resistance. 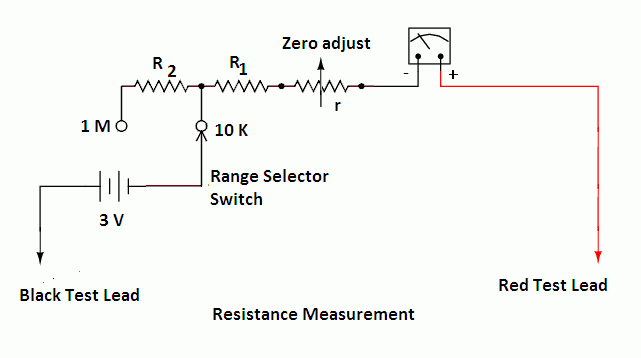 In effect, a number of low resistances are connected in parallel with the meter through a selector switch as shown in the figure. The desired range can be selected by moving the selector switch to a particular position. If the total current to be measured I is very high, the value of shunt resistance required Rsh becomes very low which is sometimes practically not possible. In this case, the connections are so arranged that as we move from low range to higher range, the meter resistance is also increased with the decrease in the value of shunt resistance. 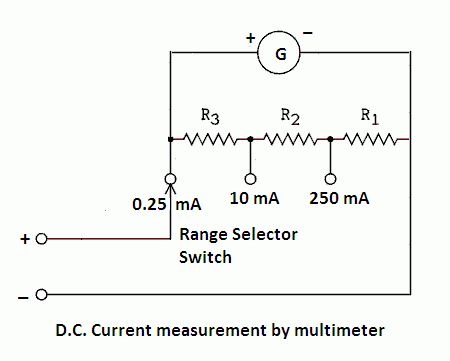 When using a multimeter as an ammeter, it must be connected in series with the branch in which the current is to be measured. The same basic instrument can be used as an ohmmeter to measure resistances. In this circuit, an internal battery is connected in series with the meter through an adjustable resistance r and the fixed resistances. The fixed resistances limit the current within the desired range and the variable resistance r is used for zero adjustments. The resistance to be measured (test resistance) is connected between test leads. The current flowing through the circuit depends upon the resistance of test piece. In effect, the deflection of needle indicates current, but the scale is calibrated in ohms to give the value of resistance directly. The ohmmeter is generally made multi-range instrument by using different values of fixed resistances. To measure any resistance on the analog multimeter, the suitable range is selected. Then the meter leads are shorted and variable resistance r is adjusted to give full-scale deflection. Under this condition, the resistance between test leads is zero, therefore, the scale of ohmmeter Indicates zero on the extreme right end. Then the resistance under measurement is connected between terminals test leads. 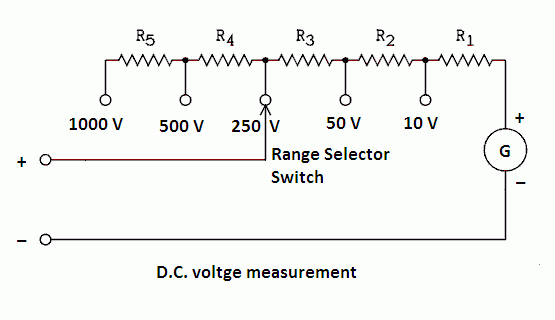 The sensitivity of an analog multimeter may be defined as the resistance offered to per volt of full-scale deflection by it. Sensitivity is the most important characteristics of an analog multimeter. If the sensitivity of an analog multimeter is high, it means it has high internal resistance. When such a meter is connected in the circuit to measure voltage, it will draw negligible current, thus measuring correct voltage. The sensitivity of an analog multimeter varies from 8k ohm per volt to 20k ohm per volt. Thanks for reading about analog multimeter working principle and block diagram of analog multimeter. #1 Which of the following cannot be described as the advantage of moving coil permanent magnet type instrument? #2 Which type of damping is generally preferred in case of instruments having weak magnetic field? #7 When a 10 µF capacitor is connected across the terminals of an ohm meter, the instrument initially shows low resistance and then slowly the value of resistance rises to a very high value. What conclusion can be drawn about the condition of capacitor? senses optical input and delivers electrical output. #15 Which voltmeter has the least power consumption? #16 . Which of the following instrument can be used for the measurement of temperatures above 1500 K ? near the initial zone of the scale. © https://yourelectricalguide.com/analog multimeter working principle & construction and block diagram of analog multimeter.